A recent exhibition turned Barrister’s Gallery into a birdwatcher’s paradise. Myles Poydras reflects on some of the standout works that were on view. Gina Phillips, Rope a Dope, 2011. Fabric, thread, paint, and ink. Courtesy the artist. “Birds of a Feather,” curated by artist Tony Campbell (one of the two members of Generic Art Solutions) at Barrister’s Gallery, recently showcased artwork by 28 different artists and featured an assortment of birds in sculpture, painting, photography, and other media. The works in the exhibition presented birds in all their recognizable forms, the winged and feathered creatures symbolizing tranquility, exoticness, and simplicity. Kim Jenkins’ Tawny Owl, 2015, a framed woodcut print named after the bird it depicts, sat quietly near the back of the gallery. Its serenity mimicked that of the actual creature, which we associate with wisdom and calm despite its predatory nature, easing viewers through the exhibition. Other similarly comforting artworks were spread throughout the space and, together, created an experience similar to a nature walk. Some of the art in the exhibition was noisier and demanded more than a birdwatcher’s passive gaze, instead presenting something confrontational. 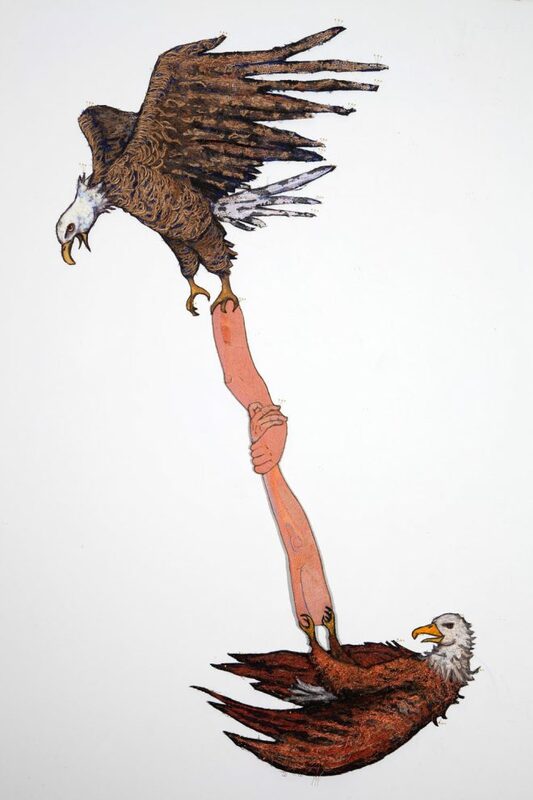 Depicting strikingly colorful eagles carrying detached human body parts in their claws, Gina Phillips’ series of works made from fabric, thread, ink, and paint made a bold statement about the image of the bald eagle and its ties to American nationalism, imperialism, and violence. In Phillips’ Flying Trapeze #1, 2010, an eagle latches onto a piece of a human arm, the work itself seemingly floating, attached on a wall in the gallery by sewing pins. Blazing red and orange embroidered fabric makes up the fierce eagle depicted in Clutches, 2010, which clenches a single hand of a dangling human body with no legs. Rope a Dope, 2011, shows two different eagles grappling in a tug of war at the ends of two distinct arms whose hands are locked together in unity. Phillips’ works, as well as some other eagle-centric art, harnessed a different feeling than Jenkins’ and the other idyllic appearances of birds in the show. In this way, the environment Campbell created by assembling such a vast variety of bird-themed artworks is truer still to nature and all the things one can see in it. “Birds of a Feather” was on view May 12–June 2, 2018, at Barrister’s Gallery (2331 St. Claude Avenue) in New Orleans.